^ a b “Greece (World War II)”. An Encyclopedia of Battles. ^ The Testament of Adolf Hitler. The Hitler-Bormann Documents, February–April 1945, ed. François Genoud, London, 1961, pp. 65, 72–3, 81. ^ a b Hillgruber 1993, p. 506. ^ a b “George II”. Encyclopedia "The Helios". Bathe, Rolf; Glodschey, Erich (1942) (German). Der Kampf um den Balkan. Oldenburg, Berlin: Stalling. Blau, George E. (1986) . The German Campaigns in the Balkans (Spring 1941) (Reissue ed.). Washington DC: United States Army Center of Military History. CMH Pub 104-4. http://www.army.mil/cmh-pg/books/wwii/balkan/intro.htm. Bradley, John N.; Buell, Thomas B. (2002). “Why Was Barbarossa Delayed”. The Second World War: Europe and the Mediterranean (The West Point Military History Series). Square One Publishers, Inc.. ISBN 0-757-00160-2. “Brallos Pass”. The Encyclopaedia of Australia's Battles. Allen & Unwin. (2001). ISBN 1-865-08634-7. “Campaign in Greece”. The Encyclopedia Americana. Grolier. (2000). ISBN 0717201333. Churchill, Sir Winston (1974). Robert Rhodes James. ed. His Complete Speeches, 1897–1963. Chelsea House Publishers. ISBN 0-835-20693-9. “Crete, Battle of”. Encyclopedia "The Helios". (1945-1955). Creveld, Martin van (1972-09). In the Shadow of Barbarossa: Germany and Albania, January-March 1941. 7. pp. 22-230. http://links.jstor.org/sici?sici=0022-0094(197207%2F10)7%3A3%2F4%3C221%3AITSOBG%3E2.0.CO%3B2-E 2007年9月12日閲覧。. Fafalios, Maria; Hadjipateras, Costas (1995) (Greek). Greece 1940–41: Eyewitnessed. Athens: Efstathiadis Group. ISBN 9-60226-533-7. “George II” (Greek). Encyclopaedia "The Helios". (1945-1955). Goldstein, Erik (1992). “Second World War 1939-1945”. Wars and Peace Treaties. Routledge. ISBN 0-415-07822-9. “Greece, History of”. Encyclopedia "The Helios". (1945-1955). “Greek Wars”. Encyclopedia "The Helios". (1945-1955). Jerasimof Vatikiotis, Panayiotis (1998). “Metaxas Becomes Prime Minister”. Popular Autocracy in Greece, 1936–41: a Political Biography of General Ioannis Metaxas. Routledge. ISBN 0-714-64869-8. Keegantitle=The Second World War, John (2005). Penguin (Non-Classics); Reprint edition. ISBN 0-14-303573-8. Keitel, Wilhelm (1965). “Prelude to the Attack on Russia, 1940-1941”. In Walter Görlitz. In the Service of the Reich (translated by David Irving). Focal Poiny. http://www.fpp.co.uk/books/Keitel/Keitel.zip. Kirchubel, Robert (2005). “Opposing Plans”. Operation Barbarossa 1941 (2): Army Group North. Osprey Publishing. ISBN 1-841-76857-X. Long, Gavin (1953). “Chapters 1 to 9”. Volume II – Greece, Crete and Syria. 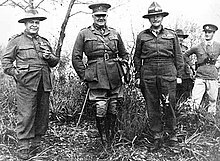 Australia in the War of 1939–1945. Canberra: Australian War Memorial. http://www.awm.gov.au/histories/chapter.asp?volume=18. McClymont, W.G. (1959). “Chapters 6 - 22”. To Greece. Part of: The Official History of New Zealand in the Second World War 1939–1945. Wellington: Historical Publications Branch. http://www.nzetc.org/tm/scholarly/tei-WH2Gree.html. Murray, Williamson; Millett, Allan Reed (2000). “Diversions in the Mediterranean and Balkans”. A War to Be Won: Fighting the Second World War. Harvard University Press. ISBN 0-674-00680-1. Neville, Peter (2003). Mussolini. Routledge. ISBN 0-415-24989-9. Papagos, Alexandros (1949) (Greek). 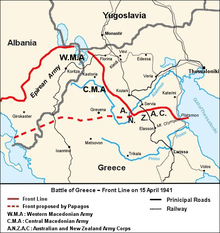 The Battle of Greece 1940–1941. Athens: J. M. Scazikis Alpha. Richter, Heinz A. (1998) (Greek). Greece in World War II (translated from the German original by Kostas Sarropoulos). Athens: Govostis. ISBN 9-602-70789-5. Sampatakakis, Theodoros (2008). “From the Invasion to the Capitulation” (Greek). Occupation and Resistance 1941–1945. Athens: Ch.K.Tegopoulos Editions. Svolopoulos, Konstantinos (1997) (Greek). The Greek Foreign Policy. Estia. ISBN 9-600-50432-6. Titterton, G.A. (2002). “British Evacuate Greece”. The Royal Navy and the Mediterranean. Routledge. ISBN 0-714-65205-9. Vick, Alan (1995). “The German Airborne Assault on Greece”. Snakes in the Eagle's Nest: A History of Ground Attacks on Air Bases. Rand Corporation. ISBN 0-833-01629-6.